Five-card draw is often the first poker variant learned by most players, and is very common in home games although it is now rare in casino and tournament play. The lowball variations make more interesting games and are more commonly played in casinos. Two to eight players can play. The descriptions below assume that you are familiar with the general game play of poker, and with hand values. They also make no assumptions about what betting structure is used. In casino play, it is common to use blinds; the first betting round thus begins with the player to the left of the big blind, and subsequent rounds begin with the player to the dealer’s left. In home games, it is typical to use an ante; the first betting round begins with the player to the dealer’s left, and the second round begins with the player who opened the first round. Play begins with each player being dealt five cards, one at a time, all face down. The remaining deck stub is placed aside, often protected by placing a chip or other marker on it. Players pick up the cards and hold them in their hands, being careful to keep them concealed from the other players. The first “before the draw” betting round occurs at this point, starting with the player to the dealer’s left (or to the left of the big blind if blinds are used). If more than one player remains after the first round, the “draw” phase begins. Each player specifies how many of his cards he wishes to replace, and discards that many from his hand. The deck stub is retrieved, and after a burn card is dealt, each player in turn beginning at the dealer’s left is dealt from the stub the same number of cards he discarded, so that each player again has five cards. It is important that each player discards the cards he wishes to replace before he takes any replacements, and that he take the same number of replacements as he discarded. 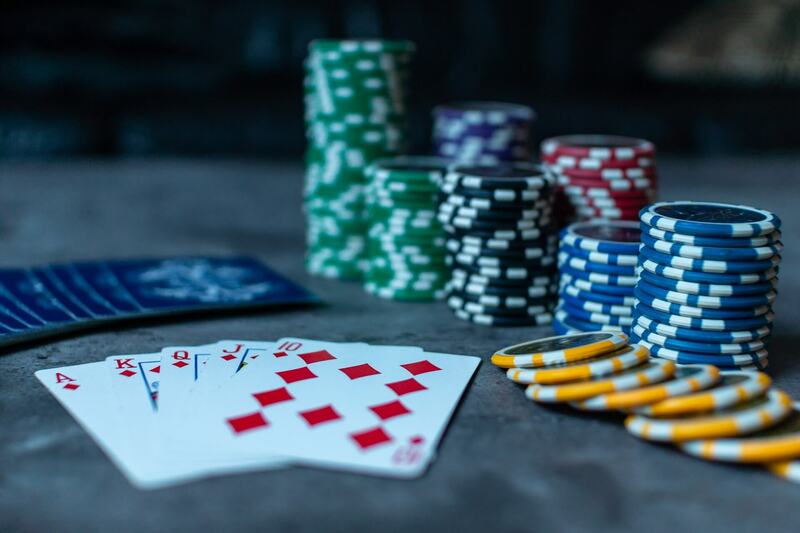 A second “after the draw” betting round occurs after the draw phase, beginning with the player to the dealers left or else beginning with the player who opened the first round (the latter is common when antes are used instead of blinds). This is followed by a showdown if more than one player remains, in which the player with the best hand wins the pot. A common “house rule” in some places is that a player may not replace more than three cards, unless he draws four cards while keeping an ace (or wild card). This rule is only needed for low-stakes social games where many players will stay for the draw, and will help avoid depletion of the deck stub. In more serious games such as those played in casinos it is unnecessary and generally not used. A rule that is used by many casinos is that a player is not allowed to draw five consecutive cards from the deck stub. In this case, if a player wishes to replace all five of his cards, he is given four of them in turn, the other players are given their draws, and then the dealer returns to that player to give him his fifth replacement (if no later player drew, it is necessary to deal a burn card first). Another common house rule is that the bottom card of the deck is never given as a replacement, to avoid the possibility of someone who might have seen it during the deal using that information. If the deck stub is depleted during the draw before all players have received their replacements, the last players can receive cards chosen randomly from among those discarded by previous players. For example, if the last player to draw wants three replacements but there are only two cards remaining in the deck stub, the dealer gives the player the one top card he can give, then shuffles together the bottom card of the deck, the burn card, and the earlier players’ discards (but not the player’s own discards! ), and finally deals two more replacements to the last player. The sample deal below assumes that a game is being played by four players: Alice, who is dealing in the examples; Bob, who is sitting to her left; Carol to his left; and David to Carol’s left. All four players ante $.25. Alice deals five cards to each player and places the deck stub aside. Bob opens the betting round by betting $1. Carol folds, David calls, and Alice calls, closing the betting round. Bob now declares that he wishes to replace three of his cards, so he removes those three cards from his hand and discards them. Alice retrieves the deck stub, deals a burn card, then deals three cards directly to Bob, who puts them in his hand. David discards one card, and Alice deals one card to him from the deck stub. Alice now discards three of her own cards, and replaces them with three from the top of the deck stub (Note: in a player-dealt casino game there is often a rule that the dealer must discard before picking up the deck stub, but this is a home game so we won’t worry about such details). Now a second betting round begins. Bob checks, David bets $3, Alice calls, and Bob folds, ending the second betting round. David shows a flush, and Alice shows two pair, so David takes the pot. Next PostDraw Poker – What is it?